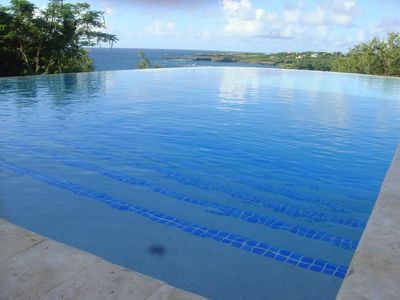 Property type: Spacious 4700 sq ft open, airy architect designed house and pool with quintessential Caribbean charm. 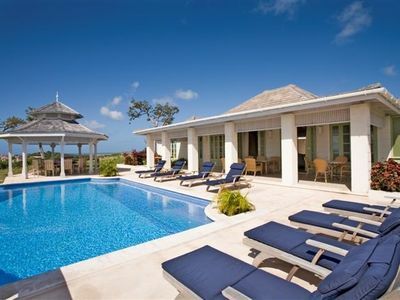 Relax and enjoy comfortable indoor/outdoor living in lush tropical gardens in an exclusive quiet location. 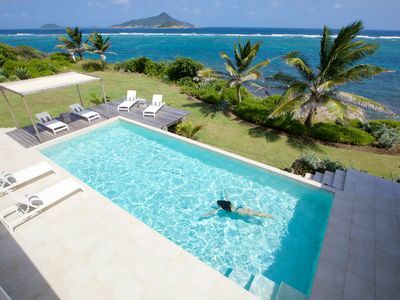 Spectacular views of the ocean and mountains, all set in approx. 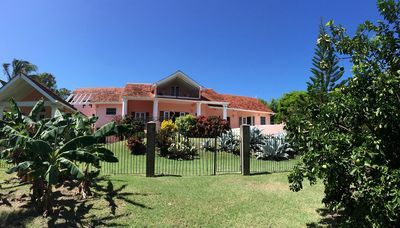 2 acres of landscaped gardens. 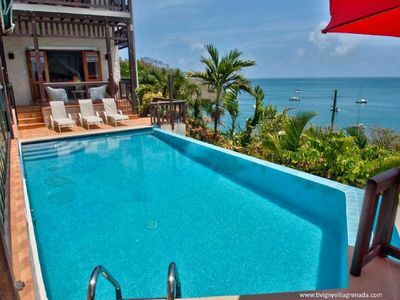 Ideally located to explore Grenada. Firefly is decorated in neutral colours with local works of art and features two large suites each with a six foot bed. 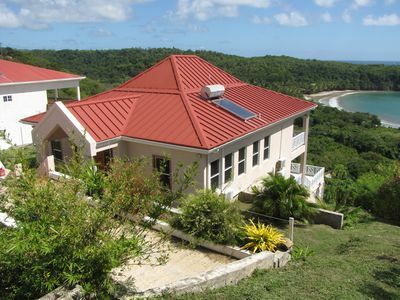 All 4 bedroom suites have fans and the villa is equipped with WIFI. The open aspect of the property means we've never needed air conditioning. Flexibility: the accommodation is flexible meaning if only two, four or six people wish to rent they can. Please contact owner for more information. 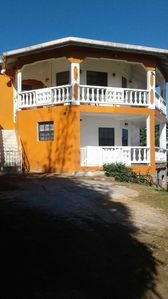 Accommodation type: Vacation Rental in a comfortable private home. Suitability: Full wheelchair access – level access throughout the house. Please note tiled floors are slippery when they are wet Probably unsuitable for very small children. UK Mobile for texts is + 44 7909 985145. Decorated in neutral colours with specially commissioned murals by the talented young artist Nikki. Sleeps 6-8 in four bedrooms all with en-suite shower rooms. 2 airy superking double suites with dressing area and shower rooms one with level access shower. Further bedroom with 5’ double, children's bedroom with full length 3 foot wide bunks and a daybed. All bedrooms afford spectacular views of the sea, bay or mountains. Dining: Formal dining room overlooking rear garden, seats 6-8 max. Alfresco dining on the terrace and there is a gazebo with spectacular views on the upper terrace. 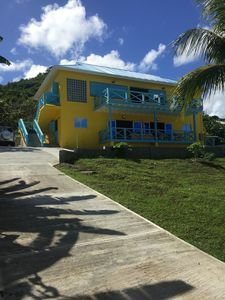 Kitchen: fully equipped with dishes and utensils, stainless steel saucepans, microwave, cafetiere, washing machine – laundry area, covered drying area, iron and ironing board, gas stove and oven, two additional electric plates. Meals: Guests provide their own meals – fruit and veg van calls at house twice a week by arrangement – see information folder for phone number. Car port and plenty of off-road parking House - all level access. Garden is on a slope. 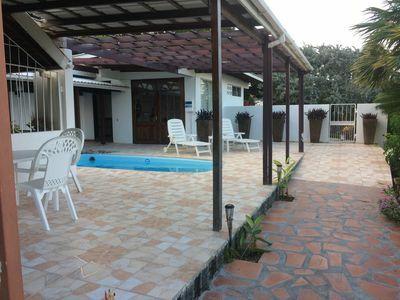 Outside: Large Terrace with pool with sunny and shaded areas. Enjoy the views from the Gazebo on the upper terrace above the house with large table and plenty of seating. Outdoor table and 8 chairs. 3 smaller round tables. Gardens: overlooking ocean and mountains set in approx. 2 acres, well stocked with seasonal fruit and vegetables. Onsite services: Property cleaned and beds changed twice a week. Further cleaning can be arranged at additional cost. Gardener 3 days a week. Both included. Local Services and Businesses: ATM/Bank, Grocery stores, Hospital, Chemist, Petrol Station, Green Thumb restaurant at end of road. Hannah will also prepare local Grenadian food for you to collect (phone no in book). Details of local taxi drivers and a local car rental company can be provided. 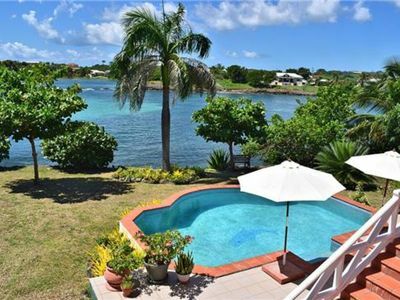 Leisure Activities: Scenic drives, walking, 3 beaches on Westerhall Point, La Sagesse nearby where you can swim the bay with the owners when they are there, every day at 10 am. 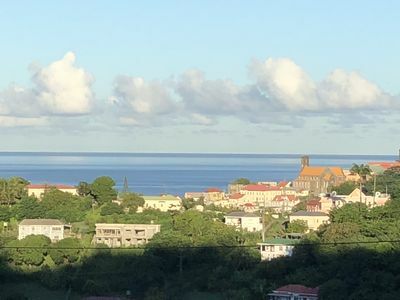 Attractions: Festivals, Sailing regatta, Rain Forests, Bird watching, Ruins, Waterfalls, snorkelling Rum distilleries and nutmeg works, Laura’s Herb and Spice and other botanical gardens. Sports and activities: Deep-sea Fishing, Golf, Mountain Biking, Walking, Bird watching, Sailing, Scuba diving/snorkelling. Air-conditioning: an open plan house which maximises the available breeze and does not require air-conditioning. 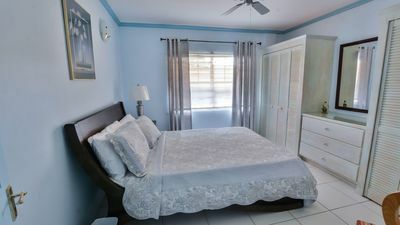 Ceiling fans in both bedroom suites, wall fans in other two bedrooms. 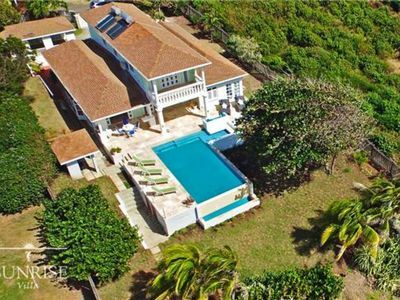 Firefly is a spacious, comfortably furnished home designed to enjoy inside out Caribbean living in lovely, unspoiled Grenada. 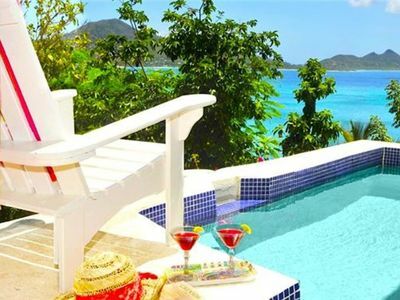 The outdoor terrace affords plenty of privacy, whether you are lazing in the sun, reading, watching the humming birds or fireflies, or just enjoying the wonderful views of the sea, bay and mountains. 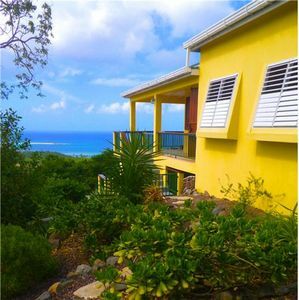 Guests at Firefly can relax surrounded by grounds landscaped with fruit trees, tropical flowering plants, herbs, bushes and other indigenous trees. Guests are welcome to ask the gardener to pick seasonal fruit and vegetables from the garden. He may also show you one of the iguanas who live in the undergrowth. The owners’ share a love of gourmet cooking so the spacious kitchen is well equipped. Guests provide their own meals. A welcome box can be arranged by separate negotiation. Chem and Jamilla call at the house Tuesday and Thursday at about 1 pm. They sell local produce and fresh coconut water if you ask they will fill the jugs (to arrange for this, their number is in the book). 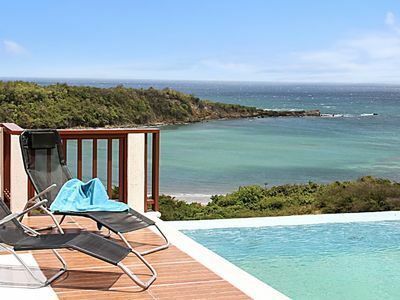 Three quiet beaches within walking distance, Spray Bay, Old Harbour beach and Boule Bay. 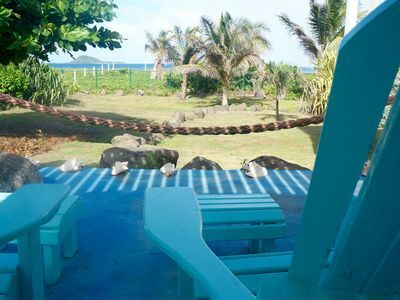 The magnificent La Sagesse beach with a good restaurant selling local fish and produce, is a 12 minute drive. 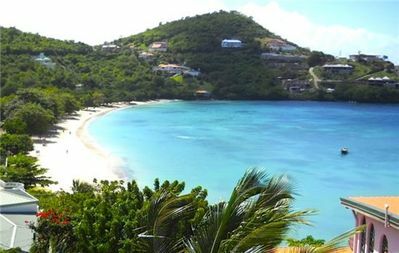 The famous 2 mile long Grand Anse Beach, and St Georges town are 20 minutes drive away where you will find more restaurants/bars, shops, supermarkets and banks. Buses run frequently from the end of the road, less frequently on Sundays. Walking distance to 3 convenience stores, chemist, petrol station, bakery and various roadside stalls selling fresh local produce. 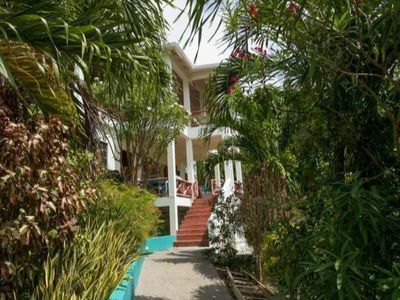 Comfortable, homely and well located, Firefly truly is the perfect place to enjoy an easy, relaxed holiday or use as a base from which to explore the unspoiled beauty of Grenada. 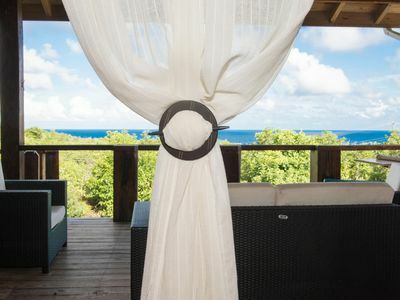 Private and romantic, Firefly is ideal for couples, honeymooners and families (not very small children). Minimum stay 7 nights. We are happy to negotiate rental based on room use as each suite is separate. Car rental available for pick up at the airport, and a welcome box in the fridge for an additional cost! Please Note ALL currency rates are based on the site you are viewing in US$ or UK£. Make sure you are aware which you are looking at as mistakes cannot be rectified.